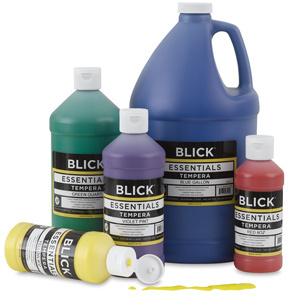 Our bright, bold colors offer endless blending possibilities. Try the fluorescent tempera colors to make artwork pop and the metallic tempera colors to make artwork glow. Formulated with safety in mind, Blick Essentials Tempera is non-toxic and contains no latex, dairy, casein, soy, egg, gluten, peanuts, or tree nuts. It is made in the USA.